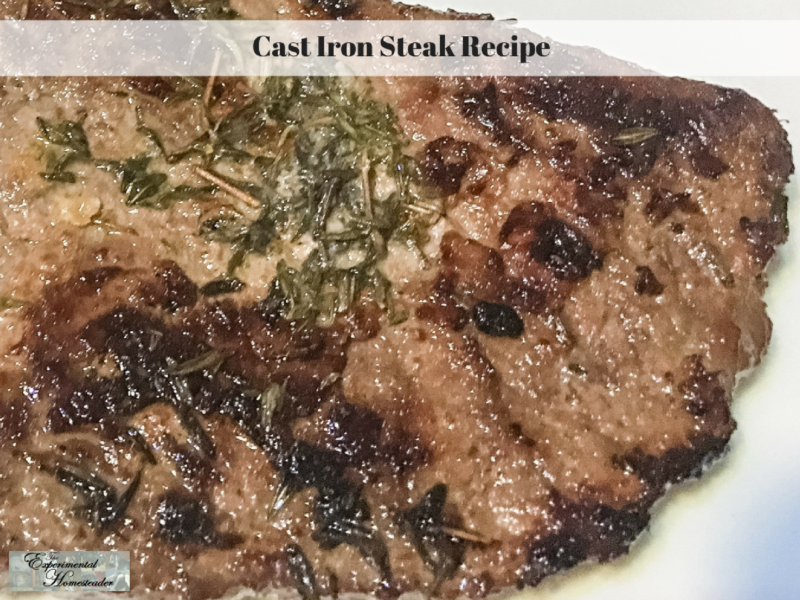 Today I am sharing with you my fail-proof cast iron steak recipe. Learning to cook a delicious, juicy steak in a cast iron skillet is not that difficult. There are a few things you need to know about using cast iron though. It is important to make sure your cast iron pans and skillets are properly seasoned before you start and that you care for them properly. It is important to not submerge them in water, not to use soap on them and to make sure that they are heated to dry after washing. 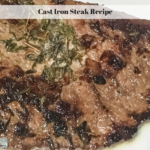 Below is my cast iron steak recipe. First remove your steaks from their packaging and lay them on paper towels making sure to cover both sides of the meat. You want to use several layers of paper towels so all the blood and liquid is absorbed. Set this aside and let the meat come to room temperature. This takes about 30 minutes. Preheat your oven to 500 degrees and then place your cast iron skillet in the oven, Be sure to use hot pads. There are special ones made for handling cast iron pans and I recommend that you get a some. Cast iron gets very hot and I have been burnt pretty badly by using hot pads not capable of handling the heat from the cast iron. I leave my cast iron skillet in the oven for about 10 minutes because I want it to heat all the way through. Remove the cast iron skillet and put it on a burner on your stove top that is set to medium high. Keep in mind that cast iron does hold the heat so if the burner is set too high you are going to get a lot of smoke – and your meat is going to burn instead of brown. Add 2 Tablespoons of olive oil and 2 Tablespoons of butter to the skillet. Let those melt and mix them together. Add 1 clove of crushed garlic and 1 sprig of fresh thyme. Give this one stir with your spatula to mix it together. Sprinkle your pan with Fleur de Sel sea salt and freshly ground pepper. Make sure this is a very light, evenly spaced sprinkle. It helps to hold the salt and pepper in your hands several inches above the pan and let it fall where it will. Add your room temperature steak to the cast iron skillet. Cook it for 3 to 4 minutes per side for rare, 7 to 8 minutes per side for medium-rare, 9 to 10 minutes per side for medium and 11 to 12 minutes per side for well-done. Another option is to pre-cook the steak in a sous-vide machine or in the oven then sear it on both sides for 3 to 4 minutes to add that crispy crust. This is the way I do it most of the time. Remove the steak from the skillet and place it on a plate. Make a foil tent to go over the top of the steak and let it rest for 10 minutes before serving. Cast iron pans that are properly seasoned are super easy to care for – rinse the food or grease out using hot water, wipe down, give them a quick, thin coat of oil making sure you wipe all the excess out and heat them in the oven or on your stovetop to dry. Then put them away until the next time you are ready to use them. If you haven’t ever tried Porter & York Brand Meats, you might want to give it a try. They ship their meat out in special packaging designed to keep the fresh, never frozen, beef that has been raised naturally (grass fed, grain finished). I was able to cut one of their filet mignon’s with a fork. Delicious. Thank you. I have not tried them but do prefer grass fed organic raised beef. I see you mention they are grain finished and it does not mention on their website if the meat is organic which makes me think the grain is not organic. In this case, I would not be interested. Do you know the answer to this? I tired to call and all I received was a state your name and Google Voice will try to reach. I did not like that, so I hung up without being able to have my question answered.